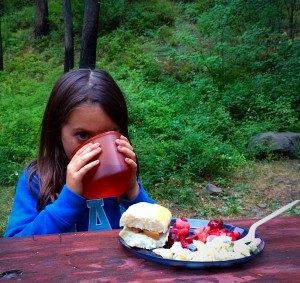 Car camping is a pretty big part of my family’s life. We love to be outdoors but we cannot always get to the backcountry for a multi-day backpacking trip. The need to be in the outdoors can be filled by some weekend car camping trips to some of our favorite locations. As we all know car camping allows for a more luxurious camp but that does not mean that you need a whole trailer full of gear. In facti try to take my minimalist type attitude that I apply to backpacking and also use that for my car camping trips. 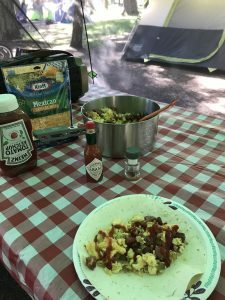 This is where the GSI Outdoors Glacier Stainless Camper comes in clutch! In the past I have had to have several pots, pans, cups, and all that other jazz. Luckily those days are now gone thanks to the great little nest full of useful camping gear. This is the whole shebang in one tight little package and I just love it! 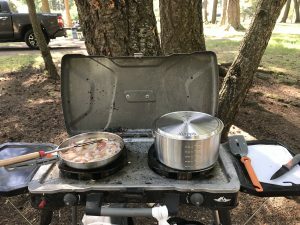 When I first received the Stainless Camper I decided that I needed to try it out at home so I used my kit to make dinner for the family. I was not left disappointed. Our next testing grounds were at Oregon’s Wallowa Lake which is our favorite car camping site. This is a great place to get outdoors but still have the comforts of modern life if necessary. We try to take at least one trip to this location a year and I was jazzed to bring along my new cook set. It was not long before I had bacon frying in the pan! The fry pan is sturdy and is of better quality than I would expect from something that looks so compact. The surprisingly heavy steel helps to provide a more even heat and I was able to cook several meals with ease. 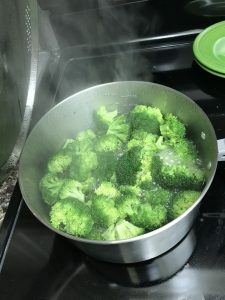 If you have never used stainless I need to remind you that it does not have a nonstick coating and so you have to use care when cooking with it. 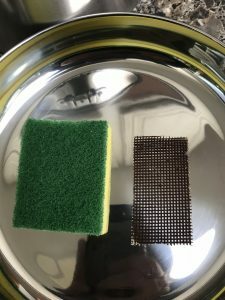 Luckily the pan cleans up very nicely with a bit of soap and an aggressive sponge. 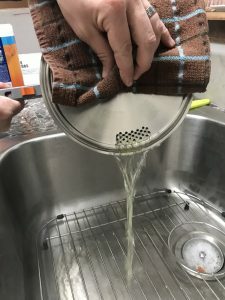 This holds true for the pots and lid as well. 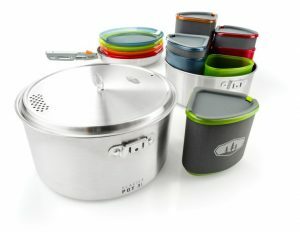 Overall this is a great compact cook set that holds its own for a 4 person trip. 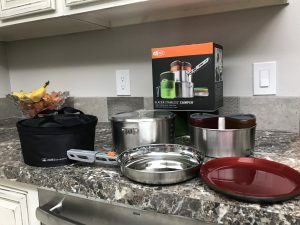 I was able to cook enough food to feed my whole crew and when it was all said and done I was able to store everything into a very compact kit that stored nicely into a tote with nearly everything else I had packed. I do not think that you will be disappointed with this set up. For the price of this kit and the simplicity of use and it’s overall functionality I cannot find anything that I would change. I guess it would be cool if they added in a few of the Foons but that is about it. I really do not know what I would change.